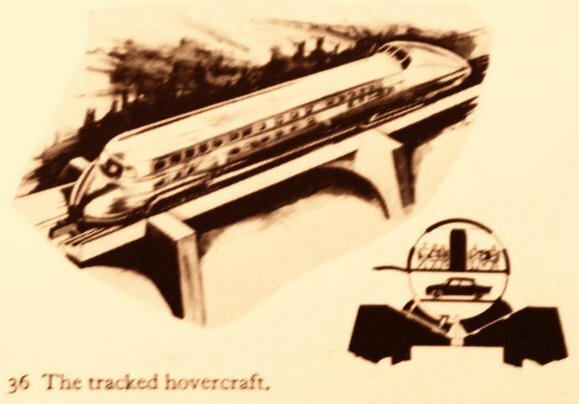 We’ve looked at jetpacks, hoverboards, tracked hovertrains, and self-driving cars: here is what I’ve learned from all these absurd concepts. In the 1960s, people were convinced that there was a huge and growing problem with transport. The then Ministry of Transport commissioned engineers and economists to look at those problems and suggest solutions. The Beeching Report recommended closing all except the very core main lines of the railway network. The Buchanan Report recommended razing cities and building neat modern concrete one-piece tower-block-and-motorway towns. These were huge problems that called for radical solutions never before heard of. That was the future of transport then, and every day since we’ve been treated to another great future of transport, from politicians, engineers, design students and photoshop fiddlers. From the politicians we get grand projects: something that will leave a conspicuous legacy. Boris spends millions on a distinctive new not-a-routemaster bus because the new bus (if it’s not ridiculed by Londoners) will be a conspicuous media-friendly achievement where fixing the distributed millions of little everyday problems with uncomfortable unreliable overpriced and overcrowded bus journeys would not. Philip Hammond loves to play with High Speed Intercity Rail and motorways, but lets councils fight over the pennies that will determine the future of people’s everyday local journeys, because big billion-pound national construction projects give the impression of getting things done where the boring work to enable commuter journeys on the existing little lines in Conwy, Cornwall, Camberwell or Caithness doesn’t. Perhaps the most perfect example in this category is the news that while the existing Greenwich and Woolwich foot tunnels fall apart (and the Clippers are cut back, and the road tunnels are closed at night, and the Woolwich ferry rusts), Boris thinks it’s a brilliant idea to build a massive cable car river crossing between Greenwich Peninsula and the Royal Docks. Meanwhile the engineers are left alone to tinker with what we already have, attempting to keep the status quo viable by “managing” the problems, designing ever more complicated traffic management schemes, and attempting to fix fundamentally flawed designs and devices. Things like 155mph superbuses and, of course, electric cars. 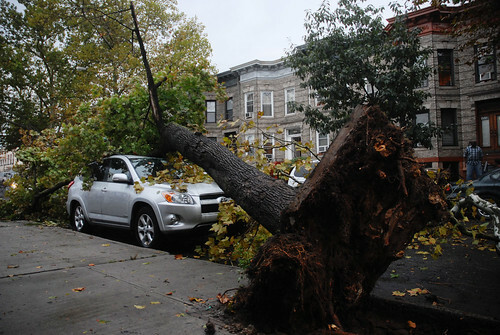 Things that will at best merely delay the day when a problem becomes a crisis. This reaches its absurd conclusion with “shared space“, when engineers conclude that the best way to manage our problems is to rip out all of the myriad expensive engineering that we have spent eighty years installing to manage our problems, and just let the problems free to magically manage themselves. And then there are the design students and photoshop fiddlers, playing at engineer. People who come up with ideas like the hourglass traffic light. Ideas that are all media-friendly pretty picture and no relevance to real world problems. This gushing moron is so enchanted by the shiny computer mockups that he’s willing to put his name next to prose that earnestly declares the segway, the backpack helicopter, the moving pavement, and the zeppelin to be the future of transport. When small children draw these pictures and tell us they’ve invented something brilliant we think it’s cute. These politicians, engineers, and amateur inventors recognise that there is a problem. (Most frequently they cite carbon emissions as the problem; sometimes it’s congestion; rarely the many other problems that afflict car addicted societies.) And they all think that a solution is in need of invention — a shiny and expensive and conspicuous and media-friendly solution. 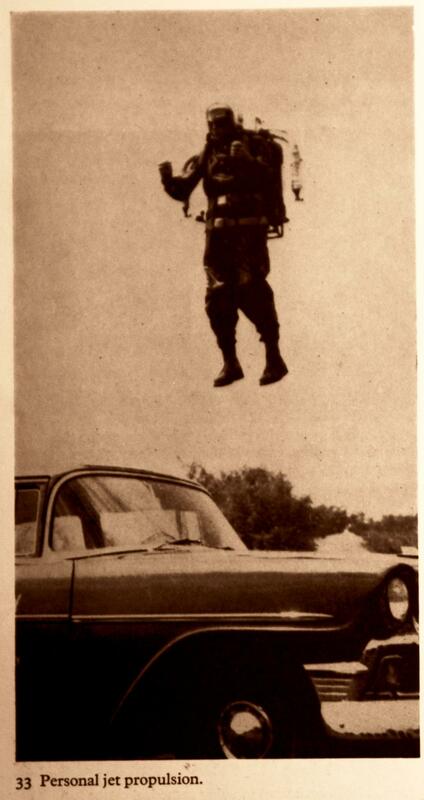 Fifty years ago it was jetpacks and hovertrains. Today it’s segways and maglevs. “You gulp the last of your coffee, wipe the egg off your chin, and dash for the door. In the driveway sits a vehicle about the size and shape of a Volkswagen. Beside the door on the driver’s side is a handleless hatch. Beneath the car, unseen, are four flanged wheels of smaller diameter than the car’s tires. This was the 1960s, when you could put a man on the moon within a decade. You’d think that the Americans could manage a simple extensive network of national, regional and local automated road/railways. Turns out, this system had not quite been completed by 1985. It’s not at all clear why this dream failed to come true. But whatever the reason, the engineers at Google have been left wondering, “where’s my self-driving car?” So they’ve built some of their own. These cars are far more fascinating than the rail-cars of the 1960s. These cars drive themselves on normal streets and motorways. In amongst lots of manually-driven cars. And pedestrians. And San Francisco’s stoned cycle couriers. All the news coverage of the Google Car fawns over its radar and cameras and obvious physical equipment, but far more interesting must be its software. You can’t program a car with simple rules to accommodate unpredictable human hazards any more than you can create a driver by giving an idiot a car manual and a copy of the highway code. How do you program a car to know that it needs to be more careful around pedestrians who are young and who are running and when the pavement is next to the carriageway and not segregated with railings and when there is another pavement opposite and there’s a playground nearby and there are parked cars and…? There are a mere 306 rules in the highway code, but there are an immeasurable number of scenarios that one might encounter on a road. So the Google Car must surely have used some very clever “machine learning”, and the 14,000 miles on the clock are presumably human-driven, with the car watching and sensing and learning how to drive — how a driver adjusts to other cars and other people, to the weather and the sound and feel of the road, in millions of situations and combinations. It must be some of the most advanced computer science ever, with some of the most brilliant minds in the world working on it. Google say that it could be available to consumers in eight years. And there’s no reason why it shouldn’t be. It’s a brilliant piece of work. 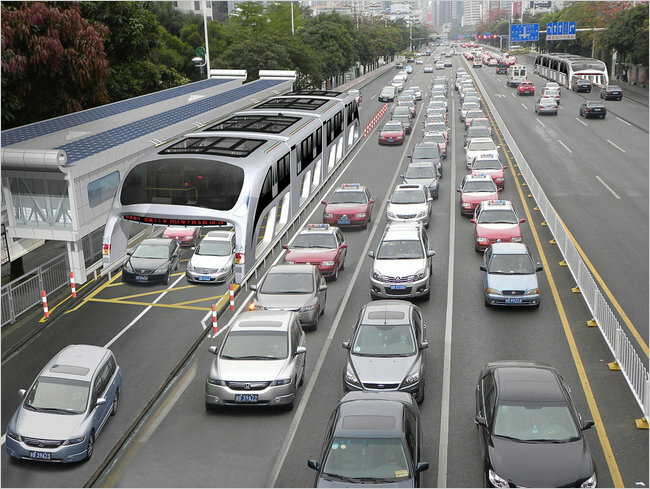 Just like the self-driving rail-car before it. 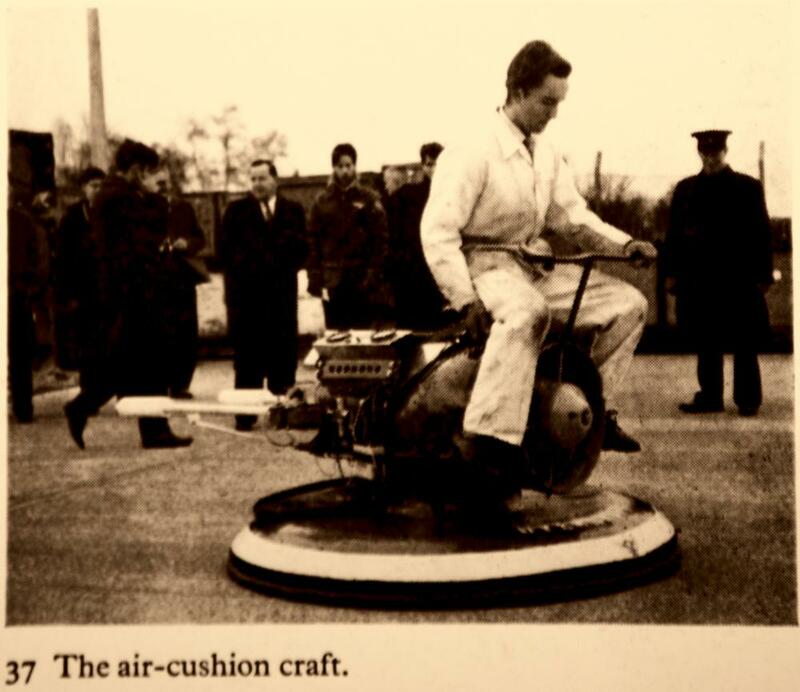 A development which may offer a more direct challenge to the motor car, assuming the problem of noise can be overcome, is the air-cushion craft. It seems to give scope for development of a small personal machine, useable perhaps eventually on ordinary pavements as a substitute for walking. Yet it may be questioned whether it would really take this form, whether the urge to put a perspex cover over it for weather protection, to use it at higher speeds, to add extra seats, and to affix luggage containers, would not soon convert it into a motor car in all respects but the possession of wheels. […] It may have a different source of motive power so that it is no longer strictly a motor vehicle, it may be quieter and without fumes, it may be styled in some quite different way, it may be produced in smaller forms, it may be guided in certain streets by electronic means, it may have the ability to perform sideways movements, but for practical purposes it will present most of the problems that are presented by the motor vehicle today. These days if you drop a criticism of car addiction into a conversation somebody will be there with a defence of car use: you could have the bigger carbon footprint. Somebody driving their compact fuel efficient car to the shops once a week might have a smaller carbon footprint than somebody taking daily long-distance rail trips. Congestion? Sure, but that won’t make much of a difference to their carbon footprint. They might drive into somebody? Sure, but that won’t make much of a difference to their carbon footprint. Particulate pollution? That’s not a greenhouse gas. Everyone seems to have forgotten that there were already multiple major problems with our transport and town planning long before we discovered our CO2 problem. We need a solution to them all, not an excuse to ignore all but one. […] it would be foolish to embark upon drastic and expensive alterations to towns to accommodate motor traffic if there were any serious doubt as to its continuance as a means of transport. The possibility most usually canvassed is that within a measurable time some kind of individual jet-propulsion unit will be developed, of which a rudimentary form has already been tried out in the U.S.A. for military use. This may well come about, but the problems of weather, navigation, air-space and traffic control appear so formidable that it may be questioned whether such a device would ever be practical for mass use, for either freight or passengers, in the crowded conditions of the modern city. One only has to think of the rush-hour conditions in any large city to realise what would be involved. The history of transport is a history of revolutions — cart horses on tracks, narrow boats on canals, steam engines on rails, and cars on roads. I guess in the 1960s, era of progress, revolution, and invention, it was obvious that this periodic replacement of one technology by another would go on forever.